Here's a quick round-up of some super hyped up products which I've only recently gotten around to trying, and have been resisting for as long as possible. First up, the ever famous Bioderma. I've managed to resist purchasing this little French skincare staple since I started blogging well over a year ago, but it was only a matter of time until I found myself unwrapping it one morning, wishing it were the evening so I could try it out. So far, so good. I do prefer this to other micellar solutions I've tried in the past, and find it ever so slightly quicker at dissolving make up, but I have a more in-depth post lined up about this shortly, so I'll stop right there! - I can see why people loved it when other micellar solutions were harder to find, but the newer cheaper alternatives work just as well. Still, it's nice to have a bottle handy and to have given it a whirl. Next is the Clarins Gentle Exfoliator Brightening Toner. Thank you Amy for being my enabler with this one! Aside from an eye makeup remover I tried years ago, this is one of my first proper purchases from the brand, and I am impressed. I've been cutting down on my Effaclar Duo [+] usage recently, as my skin has cleared right up, and I'm getting through the tubes quite quickly, so I've started to occasionally replace it in my routine with this. I must say, it sure is nice to be using a toner again! I find them so much more appealing in the warmer months. This one makes my skin appear brighter and smoother in no time at all. - Yes, yes yes yes. I was in desperate need of another chemical exfoliator, and this one ticks all the boxes for me. Even my mum is a fan after I used it on her! I can see a noticeable change in my skin already. The Clinique Bottom Lash Mascara surprised me. I thought it wouldn't have much of an effect on my lashes, at least no better than my normal mascara. But I actually found it really easy to apply a fair amount neatly to my bottom lashes. As my lashes are quite fair, it's sometimes hard to see whether I'm applying any mascara to any actual lashes, or just rubbing the wand across my skin and making a mess. The smaller wand is definitely a winner in my books, and the packaging is so pretty! - I could definitely live without this product, but it will be useful for days when I have a little extra time to get ready and want to be ultra-precise. Having said that, I probably won't repurchase it as it's quite expensive for what it is. Lastly is a product which I have been *so* desperate to try, as I suffer from quite badly dehydrated lips for most of the year. I snapped up the Nuxe Rêve de Miel in Escentual's 1/3 off French Pharmacy a couple of weeks ago, and this stuff has barely left my lips since it slipped through my letterbox. A super hydrating, but almost matte-looking formula which smells absolutely delicious, inside a beautiful little pot - what more could I ask for. - Yes, absolutely. This will be repurchased, for sure. Thanks for reading, and I'd love to hear what you think down below! 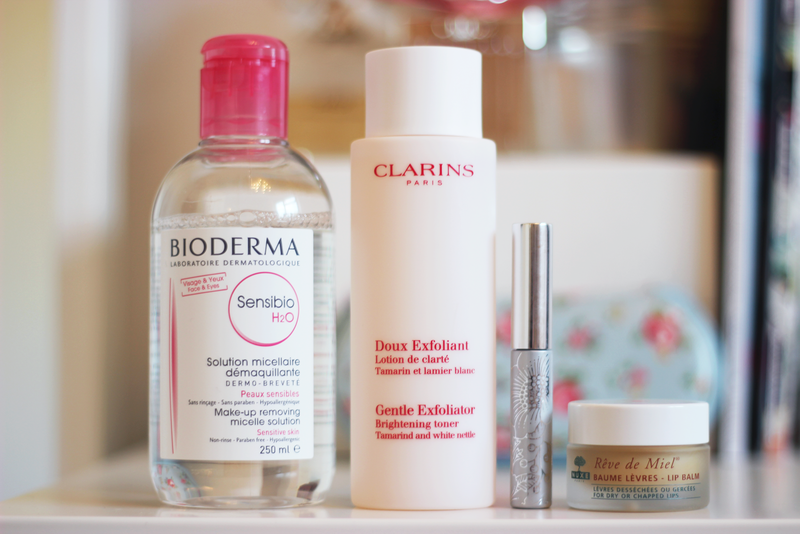 Have you ever tried any of these products before? Oh Amy I'm so glad you have got on well with the Clarins Toner as it is an expensive purchase if you're left feeling underwhelmed by it. Thank you so much for the mention! I'm quite the fan of the Nuxe lip balm too, it's pretty darn good. I hear such good things about the Nuxe Reve de Miel and everytime someone talks about it I get tempted to get it because it sounds perfect for me! Will have to remember to get one next time I'm near M&S. I never go to bed without some balm on my lips, dear Amy...this might be the next one I try!! Thank you for the tip!! I also recently received the Nuxe Reve de Miel Balm and am absolutely obsessed!